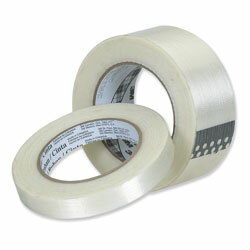 Use this 3M® Tartan™ filament strapping tape to support Bimini and Dodger frames prior to installation. Can also be used like strapping to support your patterning materials. High performance. polypropylene backing reinforced with fiberglass filaments. for light- to medium-duty bundling, reinforcing, and palletizing. No it will not. You may want to try duck tape.